Entry Deadline for 2018 has passed. Look for 2019 contest announcement in May. McKinney High School (Texas) and Calvary Day School (Georgia) have earned Staff Excellence Blue and Gold Awards for their overall performance in the 2018 Quill and Scroll Yearbook Excellence Contest. The Blue and Gold Awards note the best high school journalism offers. Winners of this prestigious award have distinguished themselves in visuals and/or writing categories in the regular Yearbook Excellence Contest. The following schools earned 2018 Blue and Gold Awards based on their staffs’ overall performance in the Yearbook Excellence Contest. The Staff Excellence Blue and Gold represents the best overall. Congratulations to this year’s Blue and Gold yearbooks. Below the Blue and Gold winners see a link to the list of the National Winners, who all are eligible for Quill and Scroll scholarships. Digital Entry — The 2018 Yearbook Excellence Contest will accept only digital entries. 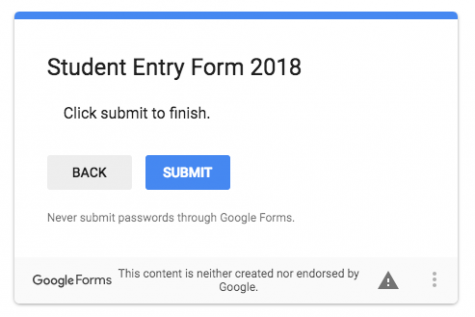 There are two forms on this page that you need to fill out. The School Registration Form will ask you to provide us information about the school, a summary of your entries, how you will pay for your entries and whether you want to order PDFs of winning entries from both 2017 and 2018. The Student Entry Form will collect all the entries, whether you have one or 88 or somewhere in between. There are 18 entry categories, and you may read about them below. Please complete both forms and make all entries IN ONE SESSION. That means you should prepare your entries before sitting down to complete the forms. If you have more than 38 individual entries, submit the first session of the Student Entry Form and begin a second session with the Student Entry Form only. You need to complete the School Registration Form only once. Please hit SUBMIT or we will not receive your entries. Preparing the Entries — All entries must be submitted electronically via a shareable link. In some categories (Theme Development, Index and photo categories) you may be uploading more than one file into a folder. Share the folder link. To submit stories, designs and photos from your yearbook, you must upload all files to a storage system (Box.com, dropbox.com, Google Drive, etc.) that will generate a shareable URL that you can enter into the Category Entry Form on the Quill and Scroll website (quillandscroll.com). 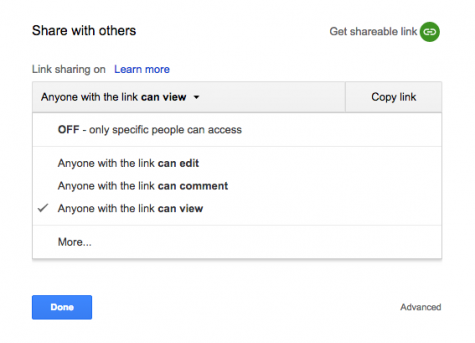 Here’s an example of a shareable link from Google Drive: (https://drive.google.com/file/d/1M6oFtFzJL1G1177kklWESP_uevigdfvMjsWJaqRa_5yPFnQGgED8ft53f19VXpICdTu6wB6g76AVeZV1/view) Simply click the link icon next to “Get shareable link.” Copy the link and paste it into the entry form. Make sure the link is public. Here’s an example. Share only the link to a file or folder that contains the proper entry. If you are submitting a photo, you may also include a link to an original .jpeg or other digital file so that judges may get a clearer sense of the photo quality, though that is not required. Deadline — Digital entries will be accepted through Oct. 10, 2018. Entry fee — There is a $5 fee per entry, except for Theme Development, where the fee is $10. Only one Theme Development entry may be submitted. Entries not accompanied by the school registration form and entry fee will be disqualified without notification. Entry requirements — Each entry must have been published in a student yearbook at any time from Jan. 1 through Nov. 1 of the contest year. Each school may submit unlimited entries per category except for the Theme Development category, which allows only one entry. The contest categories are listed and described below. While we recognize that several individuals may be involved with the production of a spread, only one student should be designated for recognition as the national winner. Auxiliary production staff may be recognized with the purchase of additional Gold Key Awards. The winning entries are automatically eligible for the Quill and Scroll Sweepstakes awards. All entries become the property of Quill and Scroll and will not be returned. We reserve the right to use entries in Quill & Scroll magazine and website. Only winners will be notified. A list of winners will be posted online. Winners of the Quill and Scroll 2018 Yearbook Excellence Contest will receive a National Award Gold Key and are eligible, as seniors, to apply for one of the Edward J. Nell Memorial or George and Ophelia Gallup scholarships. See the list of Sweepstakes and National Winners by clicking the blue button above. High school students who are contributors to or staff members of a student yearbook at any public or private high school were invited to enter the competition. Awards will be made in each of the 18 categories. There are two enrollment classes: Class A: more than 750 students; Class B: 749 or fewer. Only one (1) entry can be submitted. Entry should include cover, end sheets, introduction, division pages and closing. It may also include images of other items that helped develop your theme. Entries will be judged on overall unity of theme package including theme copy, typography, graphics and color. Please save all digital files into a single folder and share the folder link. Spreads from academics sections may be entered. Entries will be judged on the quality of copy, realistic action photos, informative and interesting headlines, captions, layout and design. Weekly, monthly or other chronological coverage may be submitted. Spreads from clubs or organizations sections may be submitted. Entries will be judged on the quality of copy, realistic action photos, well-cropped and composed group photos, informative headlines, captions, ID’s, layout and design. Weekly, monthly or other chronological coverage may be submitted. Entries from the sports section may be submitted. Entries will be judged on the quality of copy, realistic action photos, informative and interesting headlines and captions, scoreboards, and layout and design. Weekly, monthly or other chronological coverage may be submitted. Spreads with either student, staff or faculty/administration coverage may be submitted. (Mini-magazine coverage may be included.) Entries will be judged on the quality of copy, realistic action photos, informative and interesting headlines and captions, layout and design. Weekly, monthly or other chronological coverage may be submitted. Advertisement spreads may be submitted. Entries will be judged on copy, typography, effective illustrations or photos, well-written headlines, layout and design quality. Spreads with sports photos may be submitted. Entries will be judged on composition, interest and effective cropping. If you also include the original digital photo file, share the link to the folder that includes both the spread and the photo. Entries will be judged on composition, effective cropping and focus on students in learning/academic situations. If you also include the original digital photo file, share the link to the folder that includes both the spread and the photo. Entries will be judged on composition, effective cropping and focus on student life topics. If you also include the original digital photo file, share the link to the folder that includes both the spread and the photo. Entries will be judged on composition, effective cropping and focus on student club or organization activities. If you also include the original digital photo file, share the link to the folder that includes both the spread and the photo. Photos in spreads that emphasize the human-interest angle and focus on people in their environment may be submitted. Posed shots and portraits are NOT acceptable. Entries will be judged on composition, effective cropping and interest. If you also include the original digital photo file, share the link to the folder that includes both the spread and the photo. Spreads may be submitted that embody contemporary use of graphics to enhance the content on the spread. Includes the use of typography, screens, placement, rule lines, logos and other visual elements. Entries will be judged on composition, creativity and interest. Photo illustrations featuring special effects, modifications or manipulations of photographs to tell a story may be submitted. Entries will be judged on composition, effective cropping and interest. If you also include both the original digital photo file and the spread, share the link to the folder that includes both the spread and the photo. Entries must display creative use of graphics, typography, screens, photographs and/or featurettes to enhance the index presentation. Spreads from any section may be submitted that demonstrate excellence in headline writing and design. Entries will be judged on writing mechanics, effective use of typography and visual elements, and interest. Spreads from any section may be submitted that demonstrate excellence in caption writing. Entries will be judged on writing mechanics, how well the captions complement photos or visuals, and interest. Spreads from any section that demonstrate excellence in profiling a person in written and visual content may be submitted. Entries will be judged on writing mechanics, visual and design elements, and interest.